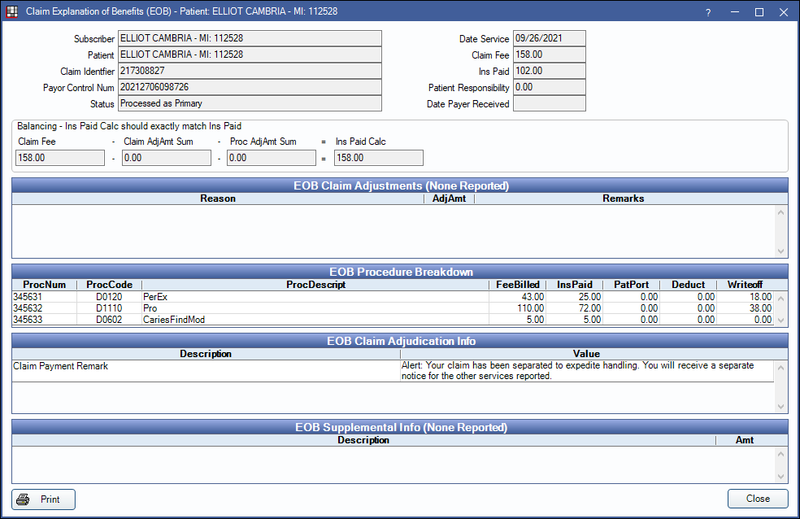 In an ERA, at the bottom left, click EOB Claim Details. Alternatively, double-click on an unreceived claim. Click EOB Claim Details in the Verify and Enter Payment window. Double click the Claim Adjustments, Claim Adjudication Info, or Supplemental Info grid to open a simple window that can be used to copy message text. To print, see Print ERA. To view details about procedures, double click a row in the Procedure Breakdown grid. Double click a grid to open a simple window that can be used to copy text. Click Print to print a copy of the procedure information.